The Project Portfolio Management Unit was established in November 2018 to provide a strong foundation for project management and project portfolio management across Finance and Administration and to successfully execute the Vice Chancellor for Finance and Administration’s (VCFA’s) strategic priorities. Establish and maintain the project management standards, metrics, and framework for projects managed within the VCFA’s project portfolio. Use a set framework to manage the VCFA’s portfolio of projects in order to increase efficiency and effectiveness by completing projects within established timeframes and budgets. Aligning projects with strategy and culture. Being agile enough to adapt to strategy shifts. Enabling the VCFA to maximize projects’ return on investment. Monitoring the performance of portfolio projects. Improving project resource management across Finance and Administration. Project Management: Practice of initiating, planning, executing, controlling, and closing the work of a team to achieve defined deliverables and success criteria. Project Portfolio: Projects, programs, and operations that are managed to maximize business value in alignment with strategic goals and objectives. Project Program Management: Process of managing a group of related projects, subprojects, and program operational activities in a coordinated way to obtain benefits not achievable from managing them individually. 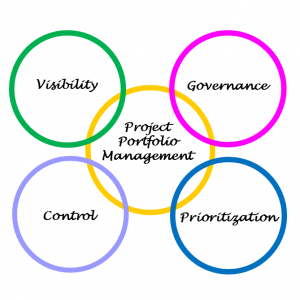 Project Portfolio Management: Process of maximizing business value delivery through the selection, prioritization, oversight, and optimization of project investments that align with business goals and strategies (i.e., ensuring the right projects are done at the right time based on available resources in order to maximize return).